The movers came last Wednesday morning to start packing, a process which was scheduled to take two days, culminating in the loading of the moving van on Friday. My suitcases were essentially packed before they started, requiring only the final zip, but turned out to be poorly organized for the trip and too numerous for the temporary housing. 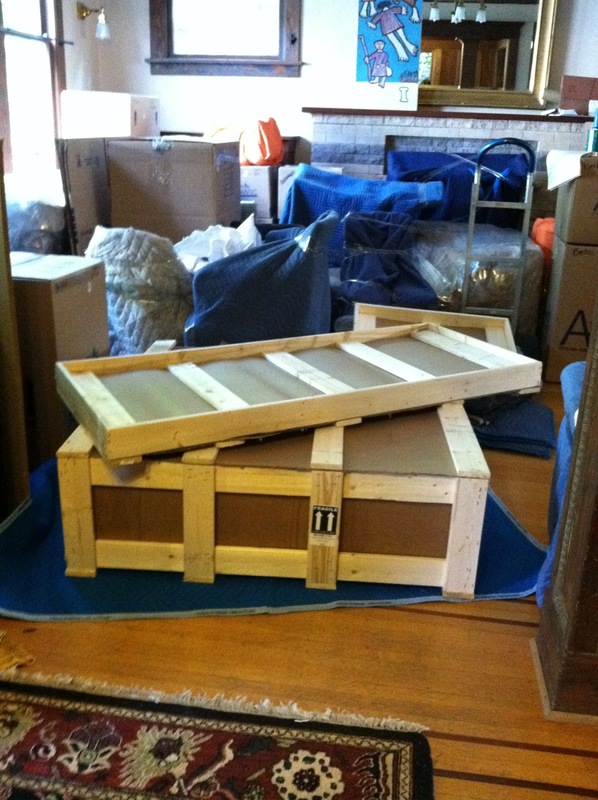 “Crating specialists” were assigned to the task of packing the marble table-tops and one large piece of art. The pair of them showed up hours later than promised, leaving only minutes before we were expected at a good-bye party. While I did not see it, one was observed injuring himself with a nail gun, and somehow they left without actually nailing together one side of the crate you see pictured. These little errors add up to a lot of nagging anxiety for me, not because I was worried about the guy or even care about any one specific tired arm-chair showing up in just-as-it-was condition when we see the furniture again, but more because I really do not want to deal with a bunch of broken things and insurance claims. We did manage to get rid of an impressive amount of the old and no-longer-needed. The kids happily parted with dress-up trunks and Lego and blocks and puppets. We donated another ten crates of books to the Friends of the Seattle Public Library, which brings us to a total around 25. They have big book sales up at Magnuson Park, and raise money for the library. Living for 17 years in a giant house with a full basement did nothing to instill any sense of discipline in terms of keeping things. So it has meant a number of dump runs and stops at Goodwill, multiple trips to Treehouse to donate beloved old toys, a trip with bunk beds to an organization that transitions homeless families back inside, and a visit to an agency that serves homeless teens (they got a pile of old, lightly used sleeping bags). It was certainly more work to find the right places for things, and in every single case we were glad we did it. Of course, all this do-gooderism was only possible because we had a truck, and because we had accumulated too much stuff. Here in New York in our temporary apartment, I do not have room for the clothes I brought, and pitched a temper tantrum about it when I tried to unpack. I have a chance to make a new start here, and I am trying to formulate a new rule that something new comes in only if something old goes out. But here, we cannot even separate our recycling from the trash–so I wonder how such a plan could be enacted. The bulk of our possessions is now in a storage facility in Connecticut, where it will remain until we have a new place of our own. I know for sure that there are boxes filled with books I do not need or clothes I will never wear. I am going to have the chance to go through the same culling process here. I think about her still.